Rome has two main international airports: Fiumicino Airport and Ciampino Airport. – Fiumicino International Airport is the main one, a very big and modern airport (with some problems of queues and lost luggage), located around 30kms from the city centre. From there you can reach the city by an express train arriving in Termini Station (the main train station in Rome). I strongly do not suggest to take a taxi, since they might be very expensive if you arrive in traffic time (and believe me, traffic in Rome is awful! ), unless you negotiate for a fixed rate. – Ciampino International Airport is the second airport of Rome, the one that hosts low-cost or charter flights. It is located 40kms from the city and you can reach the city by bus (there is a bus running all day long taking you to Termini Station in 40-mins time) or by taxi (without traffic, the journey takes around 30mins and there is a fixed rate of 35€). The first day can be dedicated to the heart of Rome. The itinerary will be quite long, so foresee an early wake up. All main Roman sites are located nearby, thus you can do everything on foot (Another advice is not to use any car in the city: most of the streets are only for residents, and the rest are very small and with big traffic issues). The streets are with pavé and the temperature might be quite high, so wear your most comfortable shoes for a journey into the core of this magnificent city. 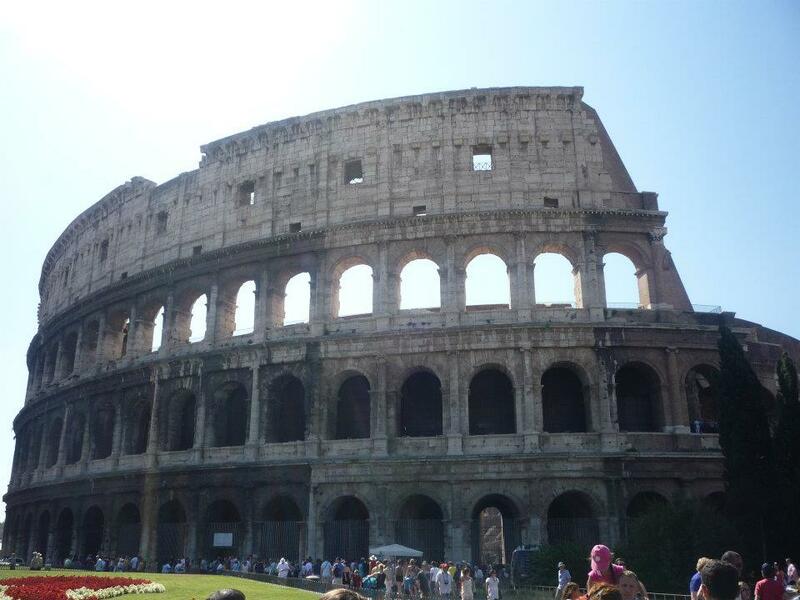 The trip can start from the most famous monument of Rome, the real symbol of the city: the Colosseum. You can get there by metro (blue line, stop “Colosseo”) and once you get off of there, you will have this incredible wonder in front of you. The Roman Colosseum was commissioned in AD 72 by Emperor Vespasian and completed by his son, Titus. This fantastic building could host 55000 people assisting at the gladiators’ combats. The huge structure of the Colosseum and the history behind will leave you simply breathless: have a visit inside and get immersed in the unique Roman past and its amazing architecture. The Colosseum is a wonderful masterpiece in the morning, but in the night it turns into a very romantic place: having a drink around there, with the view on it, will be unforgettable. 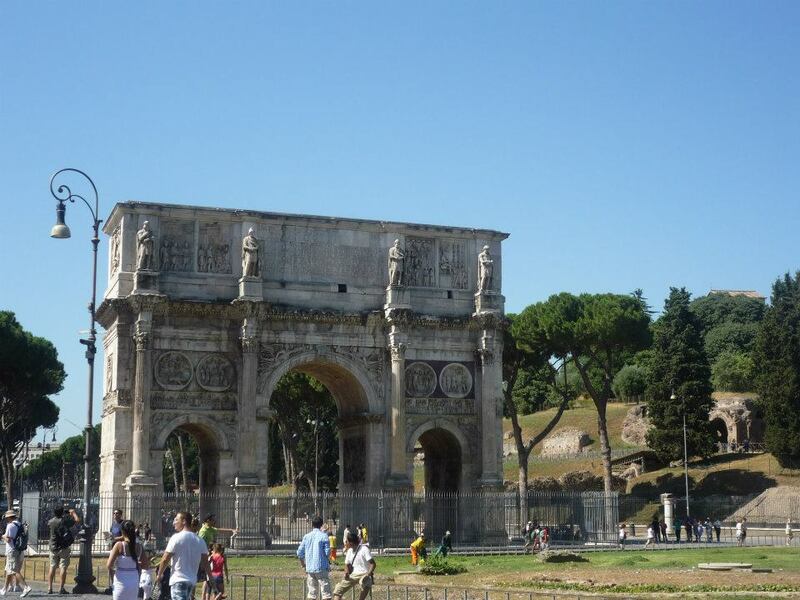 Just next to the Colosseum is the Arch of Constantine, one of the best preserved arches. This is a 25m high monument built in AD315 to mark the victory of Constantine over Maxentius at Pons Milvius. 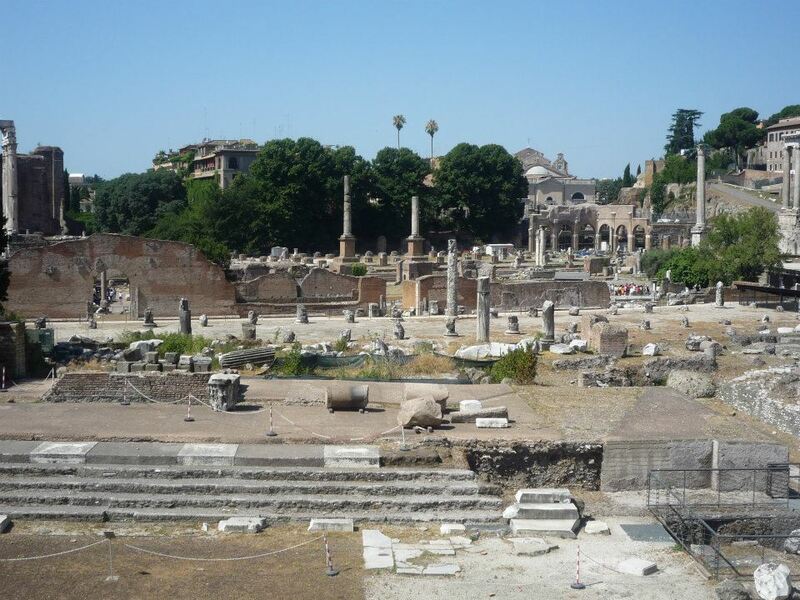 Next to the Arch of Constantine and the Colosseum is the Roman Forum. This was the area where the ancient city developed. Here was where commerce, business, prostitution, cult and the administration of justice took place. A tour inside the forum is totally worth. Outside the Roman Forum is the via dei Fori Imperiali, one of the most suggestive streets in Rome. This is a big street connecting the Colosseum to Piazza Venezia. Along this street you can admire several maps reconstructing the expansion of the Roman Empire throughout the history, and the statues of the main Roman emperors. On Sunday this street is for pedestrians only, you can enjoy a pleasant walk there or a nice tour by bike or rollers. At the end of the Fori Imperiali street, you will get to Piazza Venezia. This is a very special place in Rome, where you can admire the huge and magnificent Altare della Patria, a white building representing the country (nowadays called “wedding cake” by most of the Romans) . On this altar, there is a flame that is always on (representing the country) and always guarded by 2 special security guards. On the left side of the square is Palazzo Venezia, the historic building where Mussolini used to give his speeches to the population. Behind the square is Piazza del Campidoglio, where Roman Divinities were once praised and nowadays it is headquarter of the Italian Government. There you can also admire the wolf with Romulus and Remus statue and the Musei Capitolini, one of the main museums of the city. 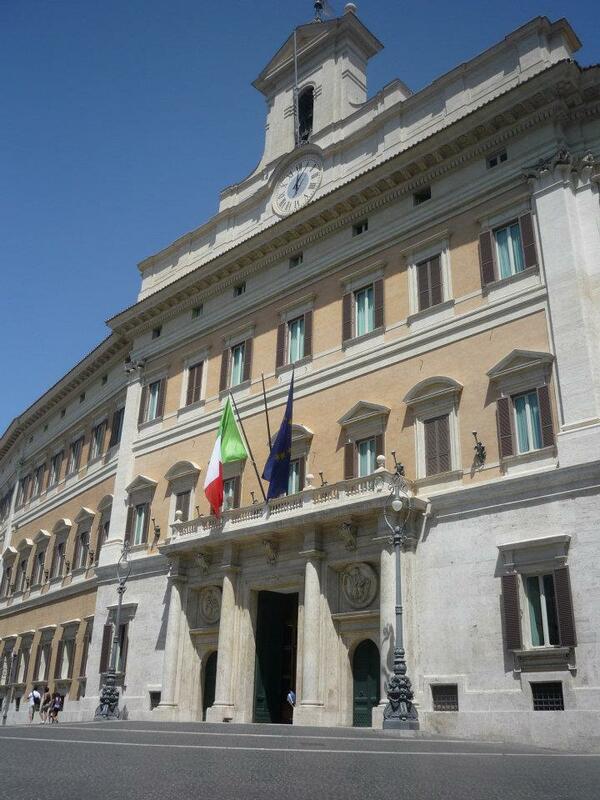 Now go back to Piazza Venezia and from there take Corso Vittorio Emanuele, one of the main streets of the city centre. Keep going through this street and after a while take via dei Baullari on the left and after few minutes you will arrive in Campo de’Fiori, a square plenty of life during daytime and night time. In the middle of the square is the statue of Giordano Bruno, who was executed in Campo de’Fiori for heresy. During the weekend, the square hosts also an interesting market, with food specialties from all around Italy. Now make a Uturn and cross Corso Vittorio Emanuele and on the other side you will run into Piazza Navona. The charm of this place is unique: a big square in pure baroque style. There are three main fountains in Piazza Navona, and the main one (the Fountain of Four Rivers) is a masterpiece of Bernini. The atmosphere around this square is simply a delight. From Piazza Navona, take via degli Staderari (or any other street in that direction) and you will arrive in front of the great Pantheon. 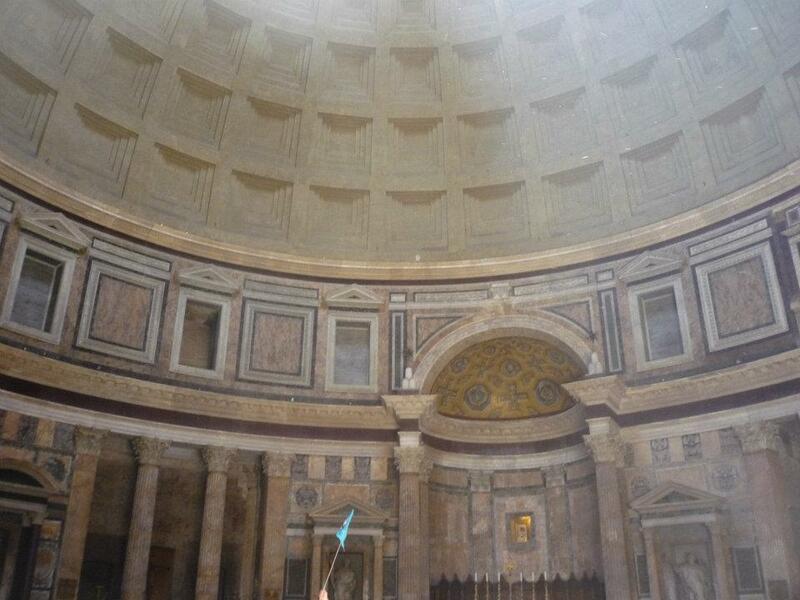 The Roman Pantheon is the most preserved and influential building of ancient Rome. It is a Roman temple dedicated to all the gods of pagan Rome. It was built between A.D 118 and 125. The emperor Hadrian built the Pantheon to replace Augustus’ friend and Commander Marcus Agrippa’s Pantheon which burnt to the ground. The structure, the materials and the shape are unique and extremely beautiful. 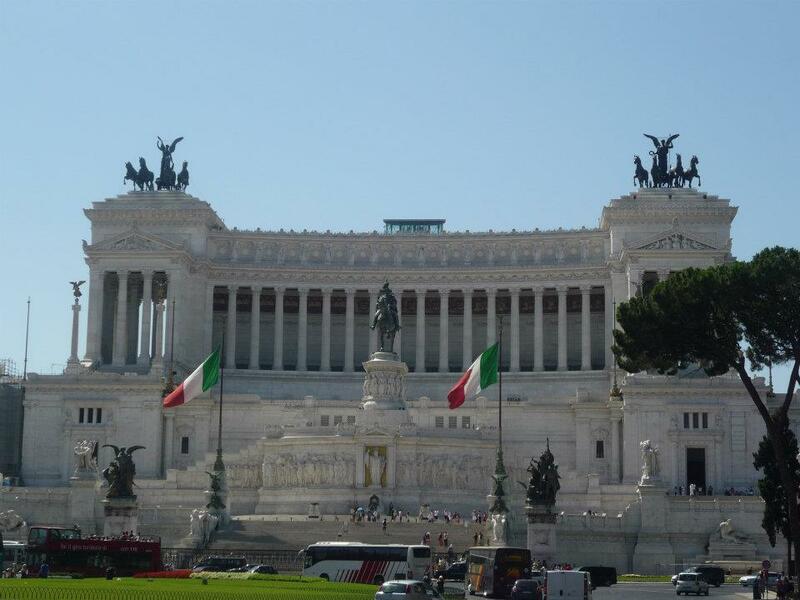 Vittorio Emanuele II and Umberto I (the most important Italian kings) and the painter Raphael are buried there. 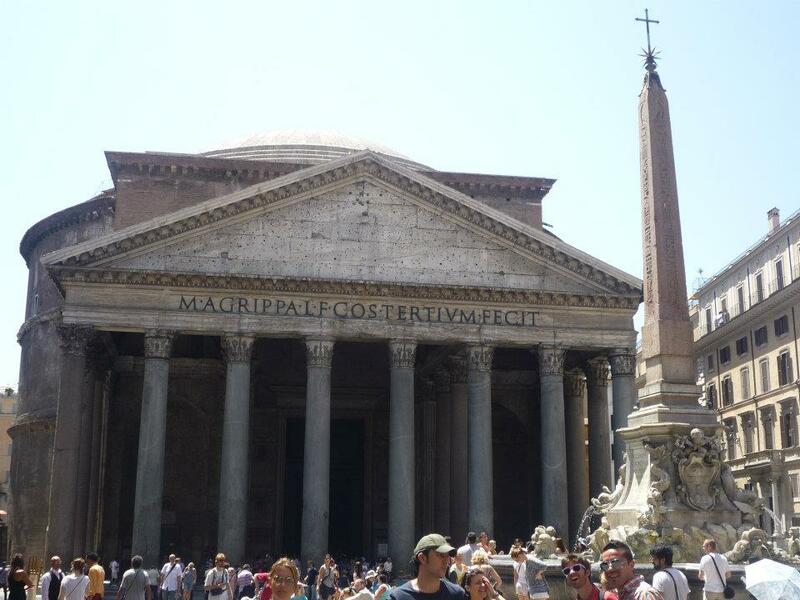 The place around the Pantheon is very nice as well, you can find several cafés and restaurants all around, I suggest you to have your lunch break around there and charge your batteries for the second part of the tour. After a deserved lunch break (and I really hope you have a typical Italian lunch over there – Mc Donald’s or Starbucks are banished from your food & beverage list! ), take any of the 2 streets opposite the Pantheon and after a nice walk in the small and ancient streets, you will arrive in Piazza Colonna, where the Italian Parliament is located. 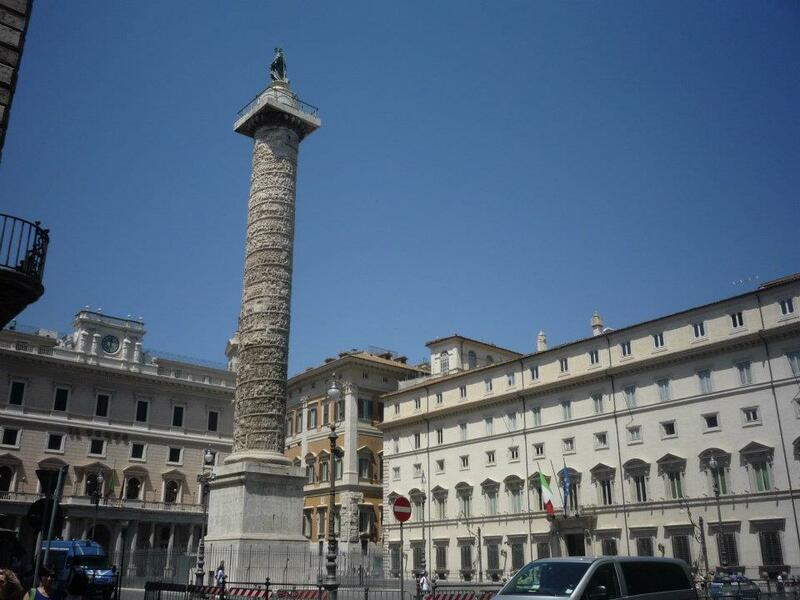 Piazza Colonna is located on a side of Via del Corso, one of the main streets plenty of shops and activities. Walk along there and take one of its perpendicular streets called via del Tritone. 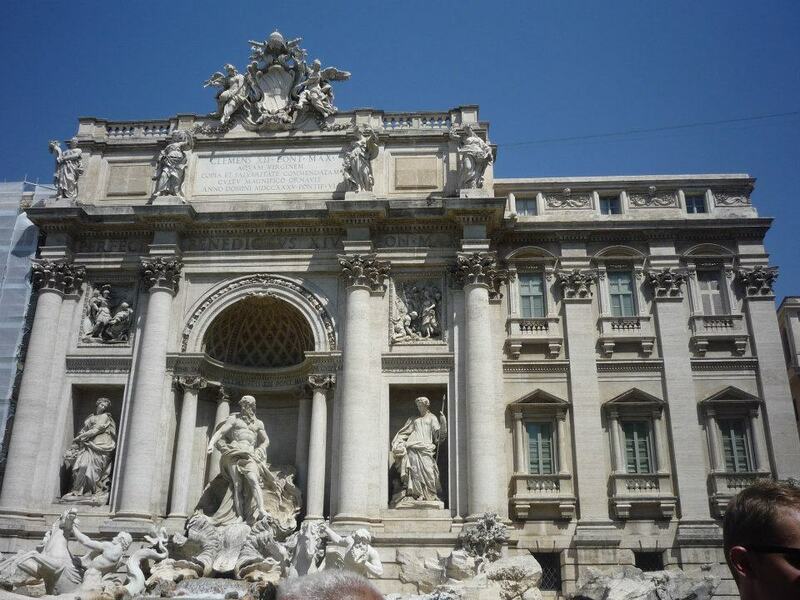 This street will take you to the (in my opinion) most beautiful monument in Rome: the Trevi Fountain. Impossible not to fall in love with this marvel! 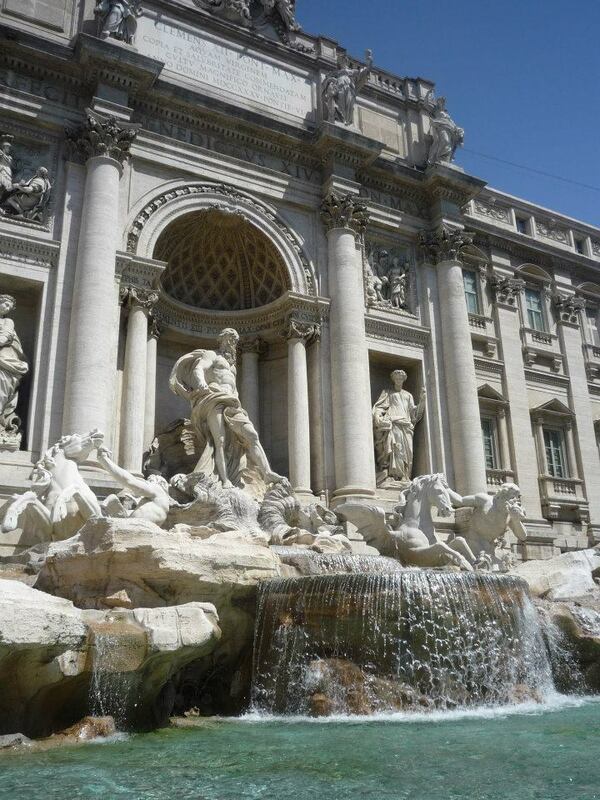 Designed by Bernini and completed at a later stage, this fountain is the best representation of the Roman baroque. The central figures of the fountain are Neptun, flanked by two Tritons. Its imposing statues, its pure white marble, its crystal water create a fantastic harmony, a pure pleasure for eyes and soul. The tradition wants that you throw a coin inside the fountain (with your back to the fountain) and make a wish..in theory your wishes should come true and furthermore it will make you be able to visit to Rome again in your life. In the past the Trevi Fountain has been also the star of many films shot in Rome, such as “Vacanze Romane” or “La Dolce Vita” (I think everybody knows the scene of Anita Ekberg in the fountain). This fountain has been and is still a dream of the beautiful Roman life. From Fontana di Trevi, take via Sistina and after a while you will arrive in another famous spot of the city: Piazza di Spagna (better known as the Spanish steps). 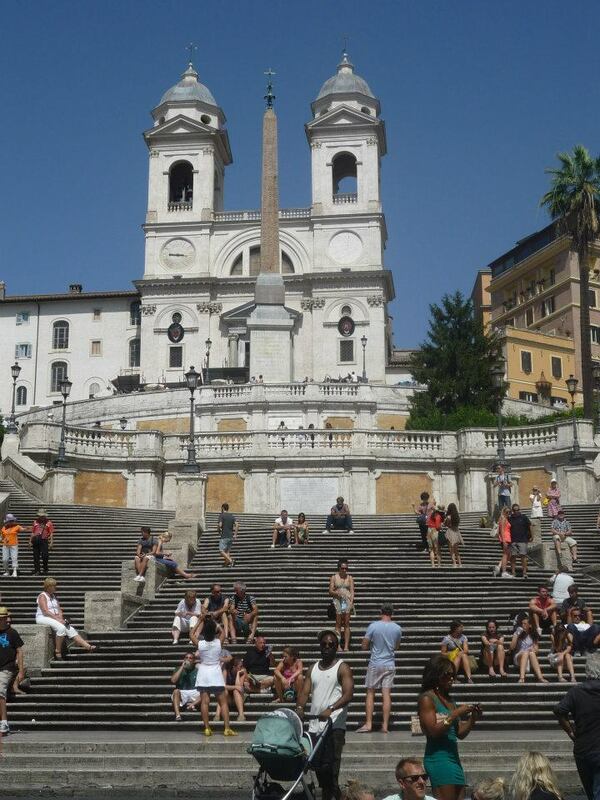 This majestic square is delimited by the Trinità dei Monti church on the top, the fantastic Spanish steps (used once a year for a high-fashion defilé …seeing the models do the catwalk down these stairs is a show to see…especially when they accidentally fall down) and the big fountain in the middle (built to commemorate a big Tevere flood in the XVI century). One of the historic buildings of this square hosted for many years great writers such as Shelley and Keats. On a side of this square is via dei Condotti, the fancy street where you can find the most expensive stores in town: Armani, Prada, Yves St Laurent, etc. On the other side is Parioli area, where rich people live (you can admire historical houses with fantastic terraces plenty of flowers) and just behind the Trinità dei Monti church Villa Borghese starts, that is literally a breath of fresh air for those who visit it. There are museums, a theatre, a bio park, a lake, rollerblade and skateboarders space as well as numerous fountains dotted throughout. Time to go back to the hotel and take a little nap, after all these kms walking under the sun you definitely deserve some rest and you need to charge your batteries for Rome’s nightlife. 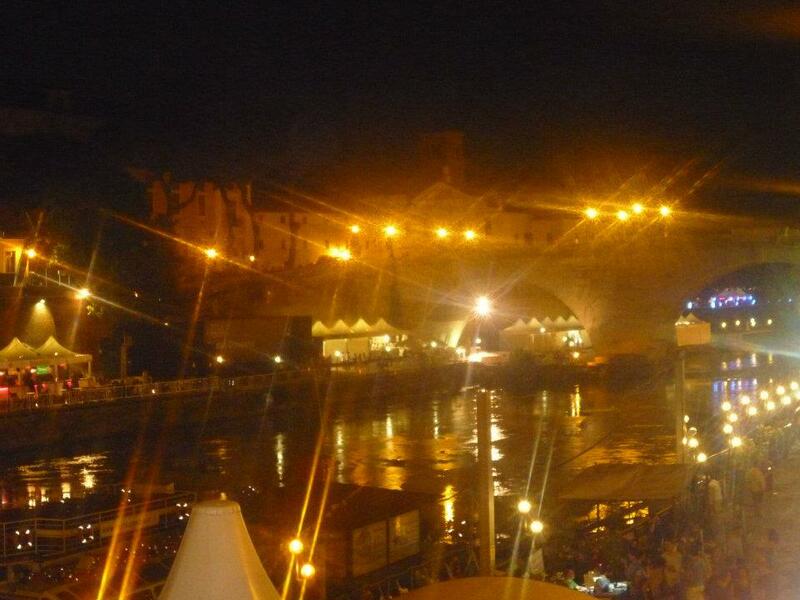 Rome is a city plenty of life, so experiencing the city by night is a must. Due to the good weather, most of the nightlife takes place outdoor and has plenty of choices according to the season. If you prefer the quiet and the romantic scenarios, you can have a drink near the Colosseum area; if you prefer something more casual, you can go to Campo de’ Fiori as well. But the core of the Roman life, where tourists do not always go, is Trastevere area. This is an area along the Tevere river (the river that crosses Rome), and there you can find very narrow and pedestrian streets plenty of good restaurants (good food, not touristic, and with affordable price), bars, live music. In summer time people usually go from bar to bar and have a drink outdoor. In the same area, in summer time there are also some nice stands on the river bank where you can have a drink or eat something outside with the view on the river and the fantastic Roman bridges. Wherever you go, you cannot forget to experience this vibrant city during the night! 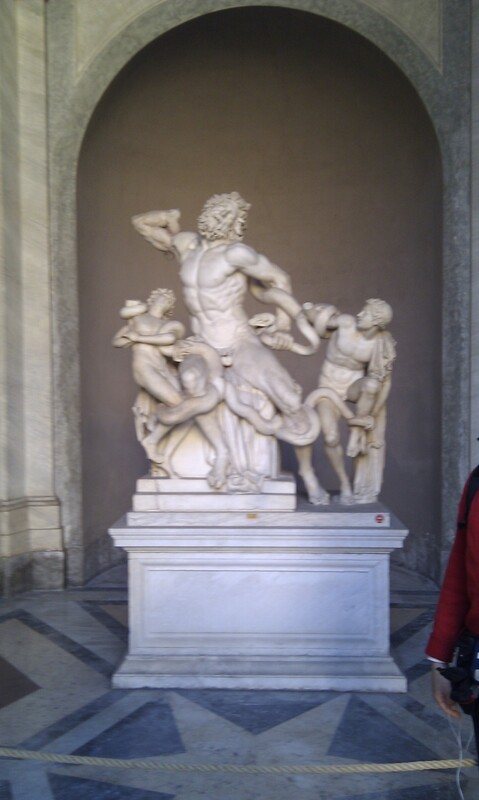 The second day in Rome can be dedicated to Vatican City, a fantastic place from the spiritual and artistic point of view. 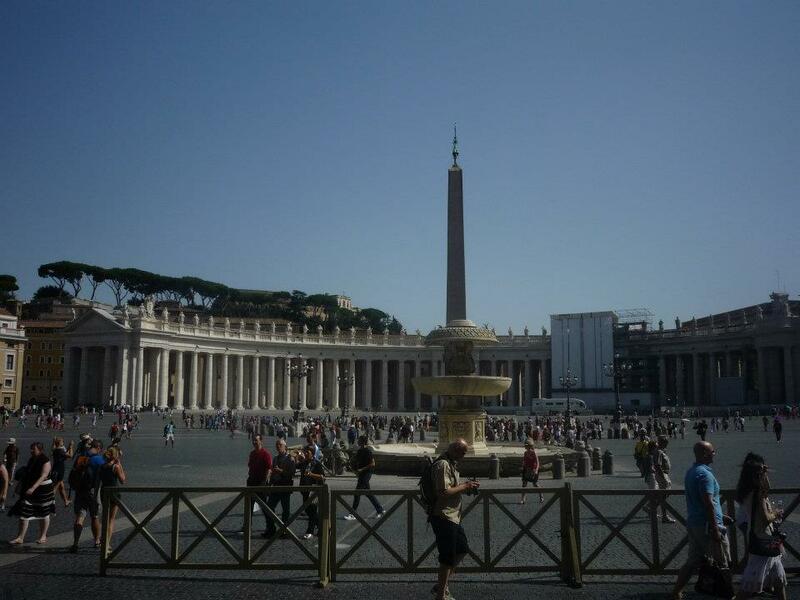 Differently from the main Roman sights, Vatican City is not very centrally located, but still very easy to reach. You need to take the metro line (red one – the same as the one passing in Piazza di Spagna) and get off at Ottaviano (the journey will take you 10mins). Once you get off the metro line, follow the signs to St Peter’s Basilica, it will be a 15mins pleasant walk. After a nice walk along a street plenty of stores, gelateria and cafés, you will arrive in one of the most majestic squares in the world: St Peter’s square. This is a huge fantastic square, surrounded by a big colonnade and with a wonderful Egyptian obelisk in the middle. The colonnade is composed of 284 columns and 88 pillars in a quadruple row, an impressive work to symbolize the ‘gathering of Christianity’. 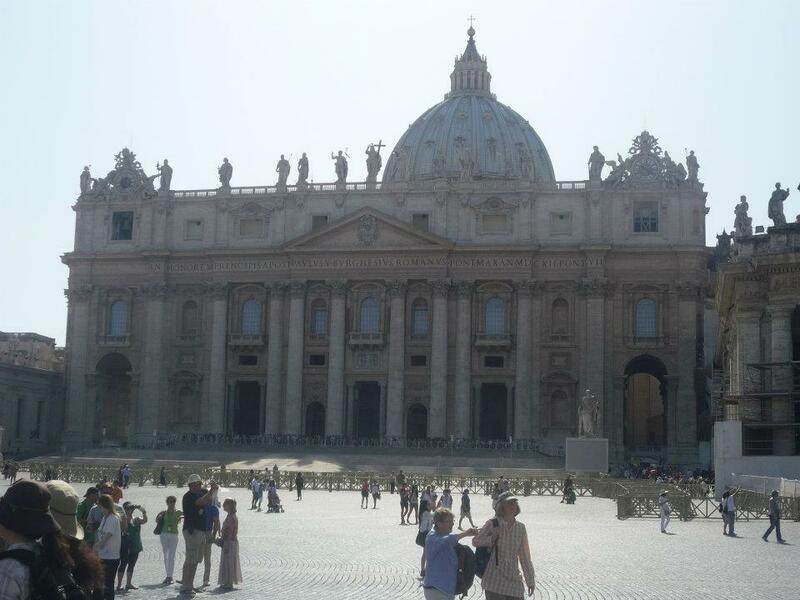 On the side of the square, you will see the marvel of the Christianity: St Peter’s Basilica. This is the world’s largest Basilica of Christianity, with its 186 metres of length, a height of 46 metres in the central aisle, a main dome 136 metre high and 42 metres large in diameter. The huge façade is 114 metres wide and 47 metres high. It has a surface of 22000 square metres and twenty thousand persons can pray in it. 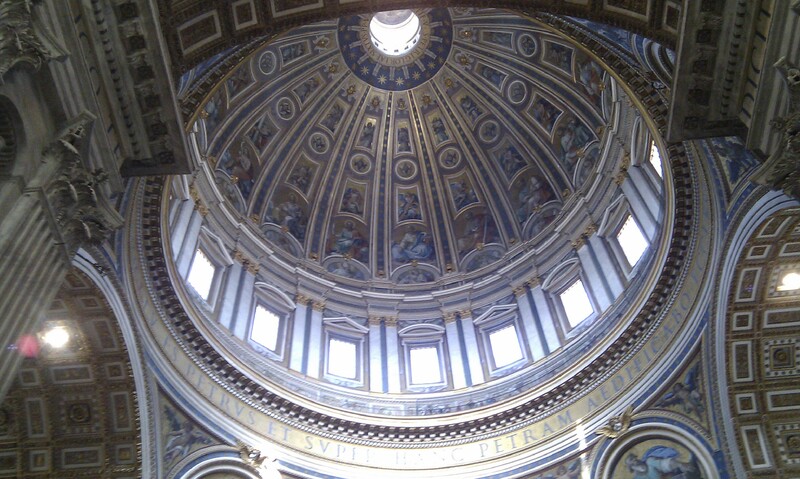 The most famous artists contributed to the construction of this jewel: Raphael, Michelangelo, Bernini. Outside, the basilica is a fantastic white giant plenty of statues, columns and wonderful decorations…but the real wonder is inside! The interior of the basilica is an hymn to the art, with its several masterpieces (among them La Pietà from Michelangelo) and decorations. Every single part of this basilica has something amazing. This probably shows the excessive richness of the Vatican (maybe too much, especially when they preach values such as simple life) , but on the other side it shows the important role the Church had in the past, since in periods of war it was the only way artists could still work and leave us their wonderful masterpieces. So if today we can admire the fantastic works of Michelangelo, Bernini, Raphael and many others is also thanks to the Church. Admire every single side of this basilica…because of the too many tourists you will probably not have the chance to feel a lot of spirituality, but at least you will feel the power of the pure Italian art. 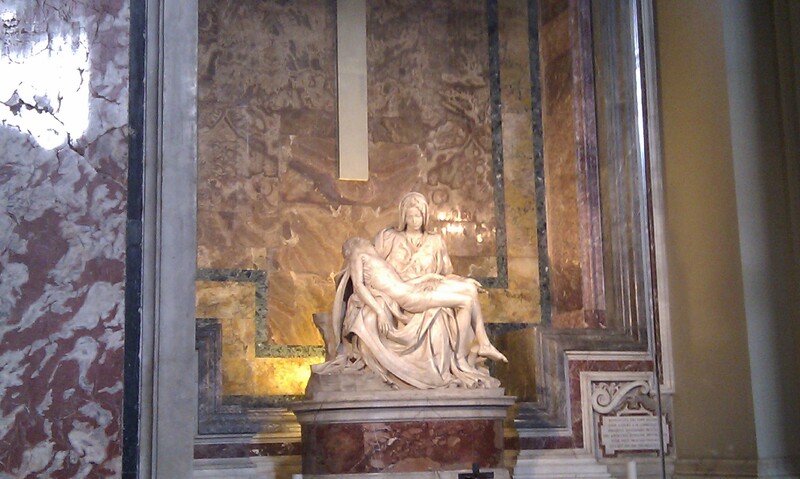 On the underground of the basilica, you can also admire the graves of all the popes in the history. St Peter’s basilica is open everyday (except sometimes on Wednesdays) to the public and for free. In order to get in there, you will have to pass a scan control and, most of all, you will have to pass a dress control. Differently from the mosques, in St Peter’s Basilica staff does not provide you with clothes to cover, so everything has to be arranged by yourself…so avoid shorts or decolleté and foresee a scarf to cover your shoulders and any dress that arrives under your knees. After this unforgettable visit to St Peter’s basilica, it is time to discover all the artistic treasures of the Vatican. So come back to the main street and follow the signs that take you to the Vatican Museums. 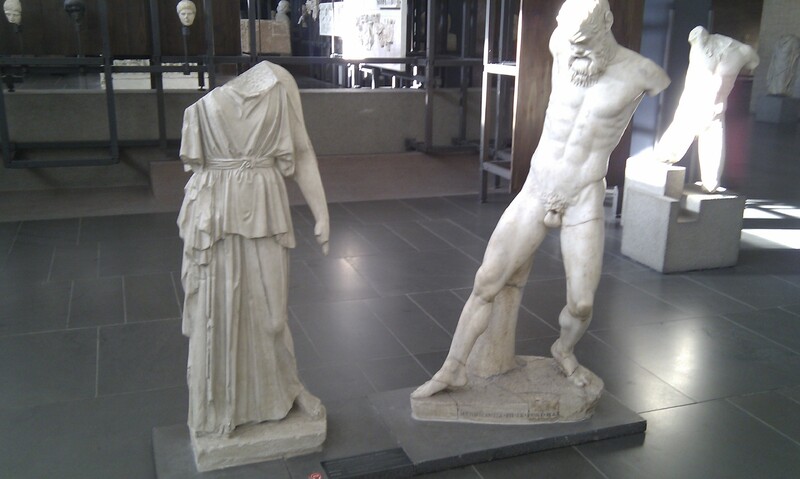 This is (for me) the most beautiful museum in the entire world…the Louvre is nothing compared to it! Its visit will take you the entire day, since there are so many masterpieces to admire and the area is very big. 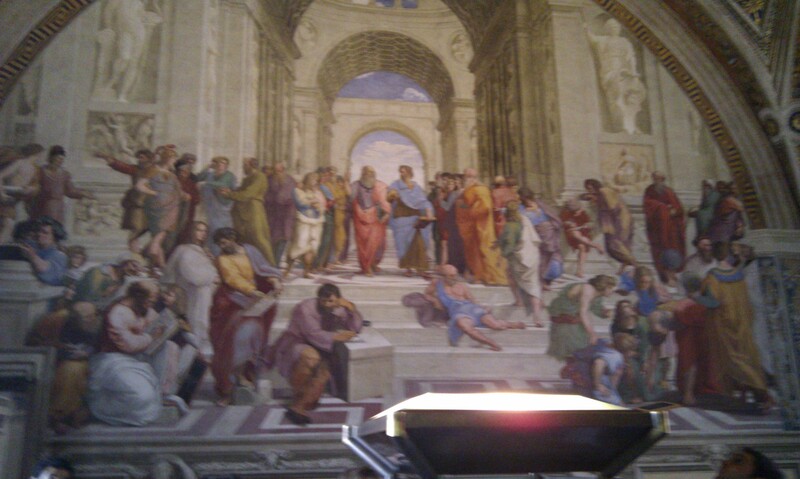 A tour in the Vatican museums will leave you speechless and also a little bit emotional, especially because you will see some masterpieces that have a unique importance in the entire art history and that you have probably studied at school during your art course. Take your time and admire each one of them, everyone has a unique charm and technique: immerse yourself in the fantastic world of the most famous painters of Italy and abroad. The Vatican museums are mainly known because, besides the greatest masterpieces, it hosts the number 1 of the frescoes: the Sistine Chapel. Anything that we say about this work will not describe enough its magnificence, nothing that has been done so far can be compared to this! The Sistine Chapel was made by Michelangelo during the pontificate of Julius II. Its design is spectacular and represents the stories from the Old Testament. The main panels running down the centre of the Sistine Chapel ceiling portray the nine episodes from the Book of Genesis, including the famous scene of the Creation of Adam located towards the alter. At either end and beneath the scenes are the figures of twelve men and women who prophesied the birth of Jesus. In the triangular spandrels above them are a further eight groups of figures. The most important part is the Last Judgment (1535) painted on the alter wall. I think masterpieces like this who recreates religious lives and messages in such unique way can be found only in the Sistine Chapel and in St Francesco Basilica in Assisi (painted by Giotto). 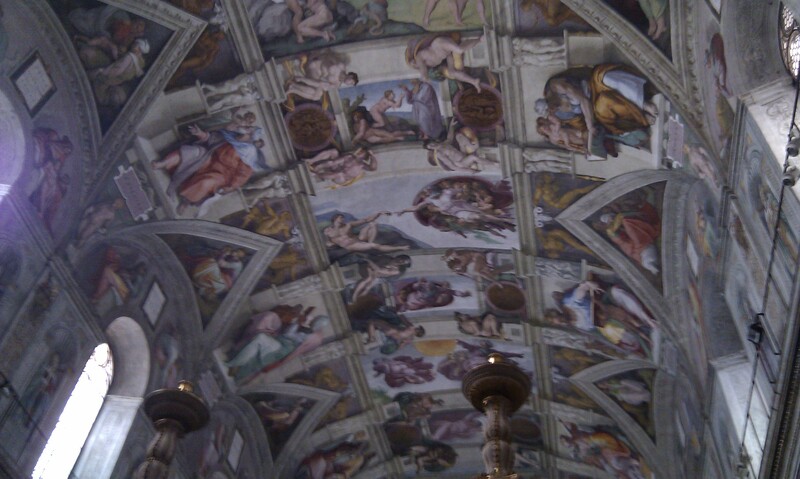 The Sistine Chapel is also the location where the cardinal’s conclave meet to elect a new pope. At your return, stop at “Lepanto” metro stop and visit Castel St Angelo. This Fortress was built as a mausoleum for the Emperor Hadrian (AD130-139), but it has also been a prison and a papal residence. It was used by former Popes who absconded there for protection in times of danger. There has been a covered passageway which still connects Castel Sant’Angelo to the Vatican. After 2 long and busy days in Rome, the 3rd one can be more relaxing (you can also have your flight back that evening). You can enjoy a very last sightseeing and/or some shopping. 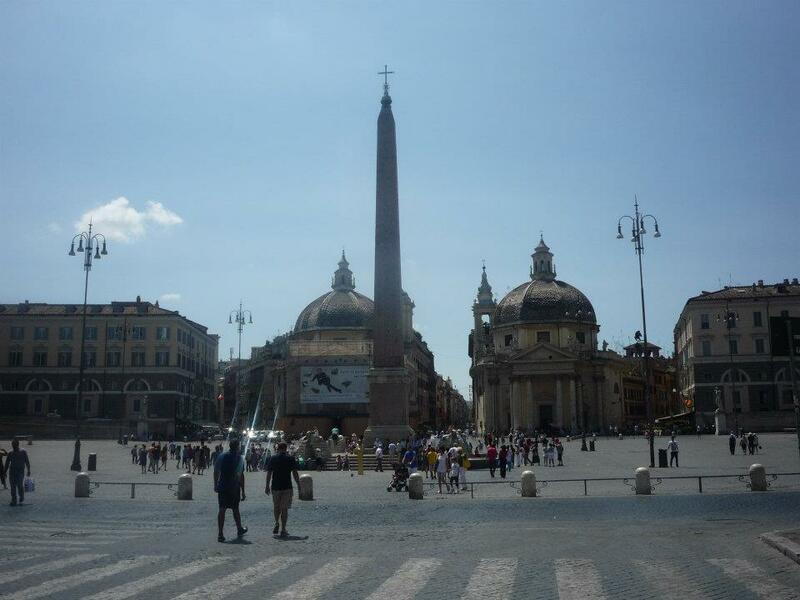 A very nice place that you cannot miss is definitely Piazza del Popolo. Take the metro (red line) and get off at “Flaminio” : you will arrive in front of a big square with interesting fountains, churches, obelisks and a very ancient gate. If you like shopping, from Piazza del Popolo you can take via del Corso, a street with plenty of nice shops (international and local ones), to experience the Italian fashion style. S. Giovanni Laterano Basilica: get off at San Giovanni stop and after a short walk you will arrive at this beautiful church. 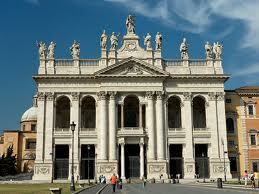 San Giovanni Laterano basilica is the most ancient church in the world. Due to the fact that the pope is also the bishop of Rome, Saint John in Lateran – being seat of the bishop’s residence – is also Rome’s Cathedral. Terme di Caracalla and via Appia: from “Circo Massimo” metro station, you will arrive in via Appia, one of the most ancient streets that expands for 560kms. This is a small streets in pavé, in a very nice location and where you can admire many important architectural wonders. 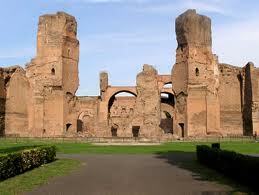 One of them is the Baths of Caracalla. were named after the emperor Caracalla who reigned from A.D. 211-217. This building is among the most monumental and imposing archeological complexes of the entire Imperial epoch. The ruins of these baths are huge and very well preserved with many mosaics. In summer time, this location is used for fascinating outdoor operas.